Written by: Victoria Irwin on February 1, 2014. 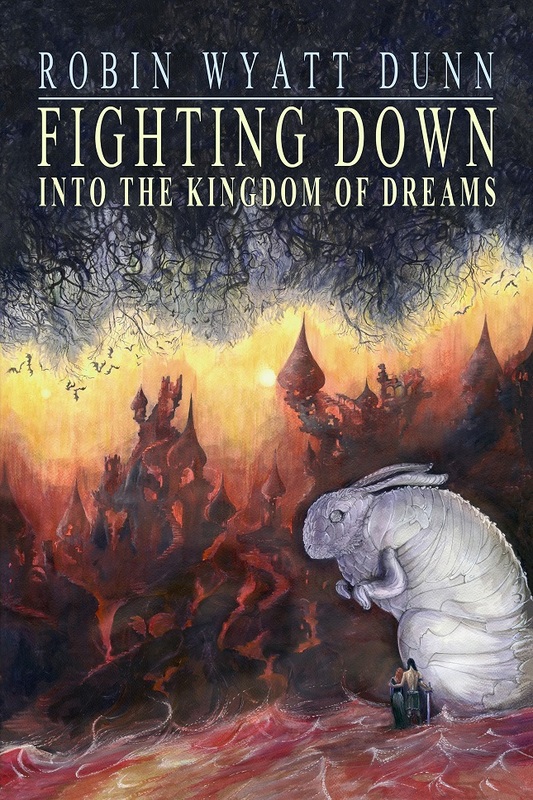 Fighting Down Into the Kingdom of Dreams is the latest book from writer Robin Wyatt Dunn. The story follows Hrothbert, a former priest who has started to fight his way down and destroy a monster known as The Wight. Told by the Hrudu Man, who often takes the form of a giant rabbit, a strange narrative of speaking rats, an alternate New York city and a corrupt former king begins to unfold for the reader. The story twists and turns, with fish men, The Hierophant and elaborate plots that seem to only slightly be resolved. Fighting Down Into the Kingdom of Dreams is much like it’s name. Like a dream, the writing is poetic, transporting the reader from place to place, image to image. However, also like a dream many times the sequences make little to no sense and jumps around. I found myself having to reread many passages just to make sure I had the information correct. Towards the end, I finally just gave up trying to keep it all straight in my mind. This is not a book for those who wish to power through a lazy read on a Sunday afternoon; this is a book that one has to savor and digest in small portions, like an eight course meal at a fancy restaurant. The book is beautifully written and charming, but requires the reader to let go of control and embrace the flow of the words and imagery. This is a book for poets; not a book for control freaks.